AR-15 ammunition is readily available, in bulk, from online retailers. NEW YORK (CNNMoney) -- Everybody goes online looking for bargains, and people shopping for ammunition are no different. Web sites like BulkAmmo.com, AmmunitionToGo.com and CheaperThanDirt.com are thriving by peddling cheap ammunition to firearms enthusiasts. 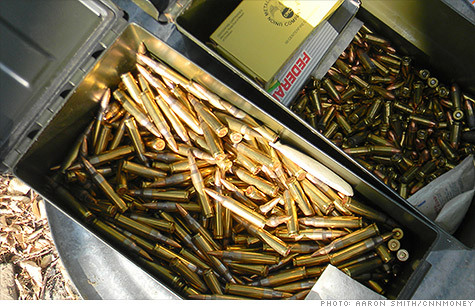 Online retailers make up a relatively new and fast-growing segment of the $2.8 billion ammunition industry. And after the mass shooting in Aurora, Colo., they're now in the spotlight. "The industry has grown immensely over the last few years, given the convenience that it provides," said Nima Samadi, senior economist IBISWorld. "For sport shooters, these sites sell in volume. They're making up a rising portion of sales." Police officials say that James Holmes, who is in police custody for allegedly killing 12 people and wounding more than 50, bought 6,000 rounds online. It's easy to see how this could be accomplished, given the preponderance and accessibility of sites that sell ammunition for semiautomatic AR-15 rifles, 12-gauge shotguns and Glock handguns. All of these weapons were allegedly used by Holmes. BulkAmmo.com sells 1,000-round batches of .223-caliber ammunition, which is used in AR-15s, for $345. Compare that to $400 for a 1,000-round case of .223's, at Rocky Mountain Guns and Ammo in Parker, Colo., which is about 20 miles from Aurora. Rocky Mountain manager Jake Meyers said it's usually cheaper to buy ammo online. "It's one of these things where, if you're looking for a better deal, you'll spend time online and find a better deal," said Meyers. He added that his friends often pool their resources and consolidate their ammo purchases from online retailers, buying as much as 7,000 or 8,000 rounds at a time. AR-15s, which fire one round per pull of the trigger, can be loaded with magazines that typically hold 30 rounds. Holmes' AR-15 was allegedly loaded with a 100-round drum, which is also available online. While the total ammunition industry is worth about $3 billion, sales to non-military consumers make up about $1.3 billion of that, according to Bruce Hammond, director of marketing and communications of the National Sporting Goods Association. Ammunition and firearms sales have been strong throughout the recession. Some enthusiasts are stockpiling amid fears that legislation restricting firearms could be coming down the pike during a Democratic administration, but those fears have yet to be realized under President Obama. Restrictions on ordering ammunition and firearms online depend largely upon the laws applicable to the state or city where the purchaser is located. In the gun-friendly state of Colorado, Holmes was able to amass thousands of rounds for an assault rifle and other firearms. "A lot of people have a lot of ammo on hand," said Samadi, "and stockpiling wouldn't necessarily raise a lot of red flags." The best-known American gun companies, Smith and Wesson Holding Co (SWHC). and Sturm, Ruger & Co., (RGR) don't actually make ammunition. The biggest ammunition manufacturer in the U.S. is the Freedom Group, a holding company that includes Remington, Bushmaster, Barnes Bullets and other well-known firearms brands. The company, which is owned by Cerberus Capital, did not return calls from CNNMoney. But it did say in an SEC filing that it manufactured two billion bullets last year. Conglomerates like Olin Corp. (OLN) and Alliant Techsystems (ATK, Fortune 500) also make ammo, primarily for the military. St. Louis-based BulkAmmo.com was the only online ammo retailer to speak to CNNMoney, but it did so through its attorney, Oliver Adams of Hodges Doughty & Carson. "My client is deeply saddened by the tragedy that unfolded in Aurora, and we join with all Americans in prayer for their families," said Adams, in a prepared statement. "The authorities are conducting a prompt and thorough investigation, and my client is actively assisting in the investigation." Adams would not comment on whether BulkAmmo.com sold Holmes his ammunition. Samadi said that the massacre is unlikely to hurt ammunition sales, even for online retailers, since similar massacres -- including the 1999 killings at nearby Columbine High School -- failed to dampen the American passion for firearms. "There's a temporary shift in public opinion right now, but generally it goes back to the way it was before," he said. "I think ultimately people are going to go after a deal, and if these online companies offer a discount compared to brick and mortar establishments, people are going to continue buying from them."